Louloua didn’t start out wanting to be a chef. Although she grew up surrounded by food, watching her mother, aunts and grandmothers “cooking all the time,” her interest in food was sparked much later than her entrepreneurial ambitions — which she has had for as long as she can remember. 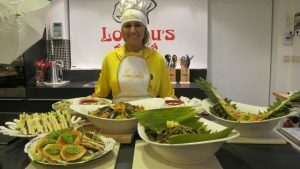 Today she is the proud founder of Loulou’s Kitchen, a state-of-the-art cooking school where she conducts a variety of classes for ladies of all ages – ranging from basic culinary skills to exotic cuisines such as Thai, Japanese, and Italian. The journey to get here, from her humble beginnings doing cooking classes in her home kitchen nearly two decades ago, has been arduous to say the least. “I struggled between the house with having little kids that need attention and care, and having to build my career,” she says. The pioneering chef persevered in spite of the pushback she received, motivated by a drive to change the culture and, over the years, found that the shackles loosened. “I really wanted more girls to know about this field as a career option. I wanted to convince more women to get into this, and that pushed me to continue what I was doing,” she says. Along the way, she garnered a number of accolades, including being invited to do recipe development for leading brands such as Maggi Arabia, Goody and Unilever. She has also participated in numerous cooking competitions and culinary events, and participated in TV shows such as “Rotanna Kaligia”; “Doctor Chef”; “Sayidaty” and “Maggi Diaries,” a program themed around empowering women through food and cooking. Her biggest turning point, however, was participating in “Top Chef Middle East” in 2011. “I had much more exposure among everyone in society. People who had heard of my kitchen would actually watch me on TV,” she says. Combined with the social media explosion of recent years, which also helped in building her brand – although she is quick to admit that she is still playing catch-up on that front, as none of it existed when she first started out – she acquired nationwide recognition, which contributed to making her dream come true in 2012, when she finally opened her professional cooking studio. The cooking school, in turn, is helping her in the mission to change societal perceptions about cooking, and inspiring Saudi Arabian youth to explore the culinary industry as a viable and fun career option. As any female chef anywhere in the world will reveal, however, it isn’t easy. “Having to work in a commercial kitchen all day long made me realize that the physical and mental effort needed to do everything that is expected in the kitchen is really hard work,” she admits. But, as long as they are prepared for the long hours and physical rigors of the job, she encourages anyone who is interested in pursuing this as a career, as it can be very rewarding.